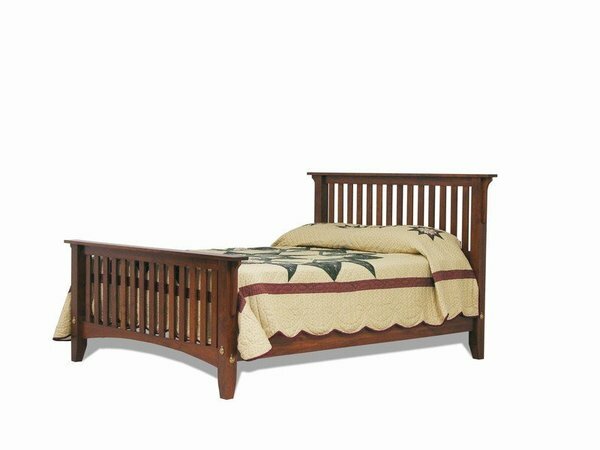 This Amish Furniture Solid Wood Craftsman Mission Slat Bed is a handsome piece of furniture with slats on the headboard and footboard in a clean Mission design. It is available in oak, cherry or maple wood and handcrafted by experienced woodworkers in Lancaster, PA.
Give your bedroom the look and comfort of a village inn with the Amish Mission Slat Bed. Mortise and tenon construction is used on the bed corners for added strength. The rails are bolted together with a through bolt and barrel nut. Each bed has five slats of which two have center supports on the queen and king beds. On all King and queen beds there will be 5 slats / 2 with props. 2 slat supports are needed to meet the mattress manufacturers warranty requirements. They simply attach to the bottom of the slats. If you have any questions on this bed or any of our other products, please give one of our Amish Furniture Specialist a call at 1-866-272-6773. Our team will be happy to assist you in any way they can. Thank you for shopping with DutchCrafters. Here are the pieces...we still love them after living with them awhile. I just wanted to let you know that the bedroom furniture arrived tonight and we love it! It is exactly what we had hoped for. I waned to thank you for all of your help, especially with the custom parts of the order. Also, I wanted to tell you that Garry was wonderful! He brought in the furniture and set it up in a very quick and professional manner.